Zoho Projects offers better control over the access levels a user has in the portal. Profile permissions have been divided into three sections. Portal Level, Project Level, and Module Level. Each permission in these sections lets users handle host of activites and/or features inside the portal. Here is a breakdown on what you can and cannot do when the permissions are enabled. Portal level permissions are available only for project users. Client profile users will not have portal level permissions. Manage Users & Clients Manage portal and client users. Add Users & Clients permission will also be enabled. Disabling Add Users & Clients permission will disable Manage Users & Clients permission. View, add, edit and delete portal and client users (except Admins), follow users in the portal. Import users from Zoho CRM, Zoho Mail Suite, MS Projects, and Google Apps. Managers can view project filters when this permission is enabled. For other users, enable project level Associate Users / Clients permission. Add Users & Clients Add new portal users from the Users section inside a project. Without Manage Users & Clients permission, the user will only be able to add new users to the portal from inside the project. User will not have access to Manage User section in the Settings page. New Project Users can create new projects. Import MPP files (Project and Settings page), Project ICS, view Project Timeline Gantt, Export Projects. Manage deleted, archived, and trashed projects Users can manage deleted and trashed projects. View archived projects. Project Groups, Templates, Layouts & Fields Users can view, add, edit, and delete project templates. 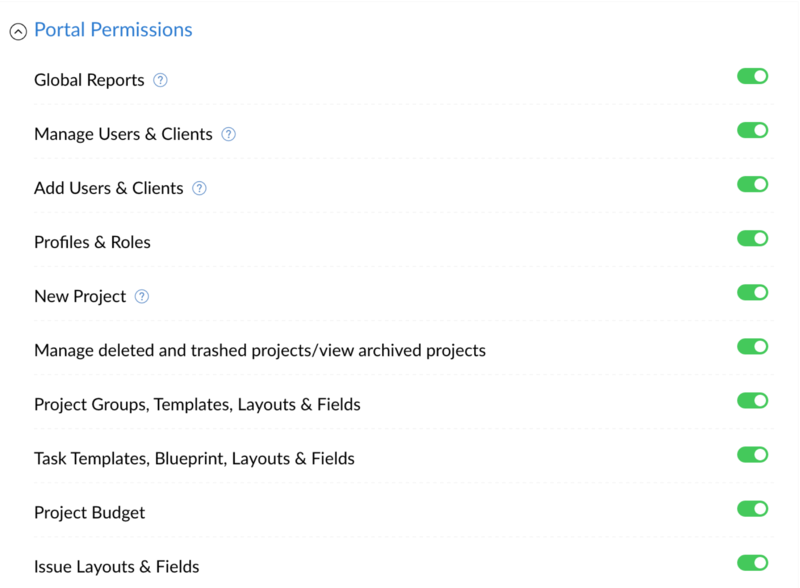 Manage project groups and project layouts and fields. Task Templates, Blueprint, Layouts & Fields Users can view, add, edit, and delete task templates, task custom fields. Users can create blueprints and associate them to tasks. Configure task blueprints. Project Budget Enable Project Budget setting. Only Portal Owners can add Admins to the portal. Portal level permissions can be granted only to user profiles. Project permissions can be given to user profile and client profile users. Client profile users can be given access to forums, pages, and events only. Project Settings & Issue Tracker Users can edit Project Settings and Issue Tracker settings. Archive projects, edit project, email alias, and forum category. Issue tracker business rules, SLAs, notifications, fields, client permissions, email settings, email templates, link issues, webhooks, and custom functions. Associate Users / Clients Add existing portal or client users to projects. Dissociate users/clients, follow other users in the project, export project users, view profile permissions, customize user permissions inside a project (except for admins and project owner). This permission along with Users & Clients will let user access project filters in the projects list view. Project owners will have all permissions inside the project irrespective of their profile. You can give access to only external forums, pages, and events for client profile users. 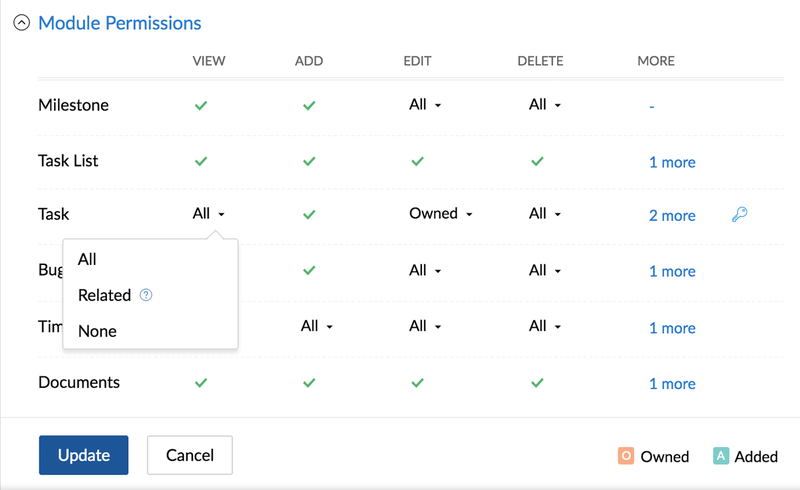 This section lets you set permissions at a granular level. These can be applied to both user and client profiles. Timesheets will not be available to client profile users. View Users can view all milestones in the project. User can follow and add comments to milestones. All: Users can edit all the milestones in the project. Reorder and move milestones. All: Users can edit all the milestones in the project. None: Users cannot delete milestones in the project. View Users can view all task lists in the project. Follow task lists and add comments to task lists. Add Users can add task lists to a project. Choose from task templates when adding task lists. Edit Users can edit task lists. Move and associate task lists. View All: View all tasks in the project. Export tasks, create task custom views, access task chart view, resource utilization chart, task reports, chronology gantt, milestone gantt, comment on tasks, add documents to tasks, view task documents, view task activities, and follow tasks. To view the planned vs actual report for tasks enable View > All permssion in timesheet. Related: The users can only view the tasks that are created by them, assigned to them, wherever they are @ mentioned or selected in a picklist field. Export tasks, create task custom views, comment on tasks, add documents to tasks, view task documents, view task activities, follow tasks. Add Add tasks to projects. Import tasks, copy tasks. Add subtasks. Owned: Users can edit only those tasks which are assigned to them and other unassigned tasks. Move tasks. Set dependency from tasks owned by user to other tasks within and across projects. Added: Users can edit tasks added by them and other unassigned tasks. Move tasks. Set dependency from tasks added by user to other tasks within and across projects. Both: Users can edit tasks added or owned by them and other unassigned tasks. Move tasks. Set dependency from tasks owned and added by user to other tasks within and across projects. All: Users can edit all tasks in the project. Filter My Tasks by assignee, export My Tasks, mark task lists as complete, drag & drop subtasks, convert subtasks to tasks, update tasks in bulk (classic and plain view), create custom views with accessibility permissions. Set dependency between all tasks. None: Users cannot edit any tasks in the project. Owned: Users can delete tasks assigned to them and other unassigned tasks. Added: Users can delete tasks added by them and other unassigned tasks. Both: Users can delete tasks added or owned by them and other unassigned tasks. All: Users can delete all tasks in the project. None: Users cannot delete any tasks in the project. 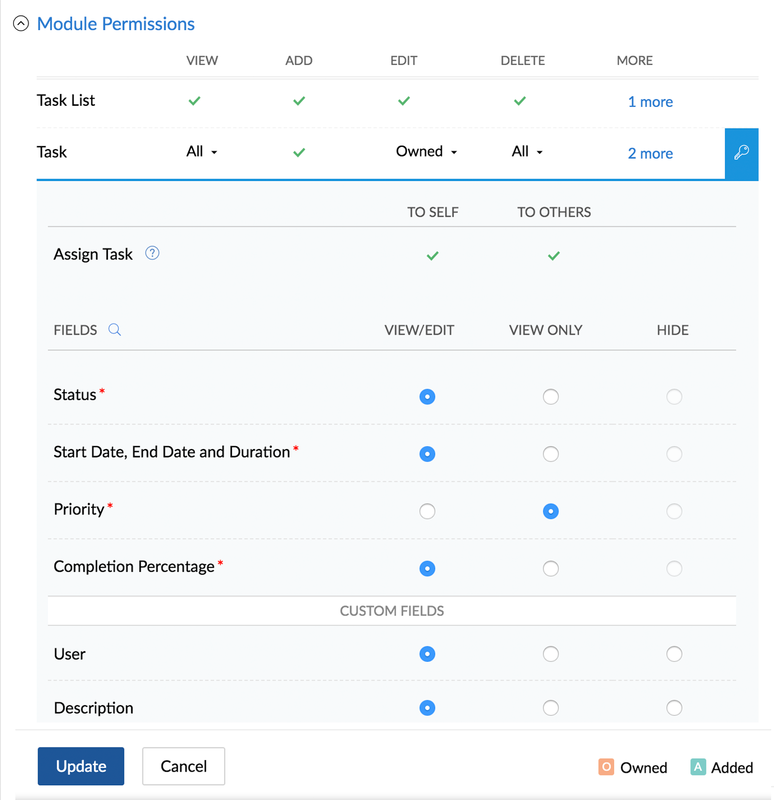 In the module permissions for tasks, click to customize Assign Task permission and Field access permission. In Assign Task permission, there are two options based on which the user profile can assign tasks. TO SELF: Users can assign tasks to themselves. TO OTHERS: Users can assign tasks to others. Also, it is based on the edit permission given for tasks. For example, if you select “Owned” in edit permission and select both the options "To self" and "To others" in Assign Task permission then the user profile can assign their tasks to others, and pick up any unassigned tasks or assign them to others. However, if you select only one option "To self", the user profile can only pick up the unassigned tasks but they cannot assign them to others. Based on the field access permission, the user profiles will be able to view or edit the fields. The access permissions can be customized for both default and custom fields, however, you cannot hide the default fields. VIEW/EDIT: Users can view or edit the field value. VIEW ONLY: Users can only view the field. HIDE: Users cannot view the field. View All: View all issues in the project. Export issues, create issue custom view, use notification helper, add and view comments to issues, follow issues, view attachments, view changesets, view linked issues, and issue reports. Related: The users can only view the issues that are created by them, assigned to them, wherever they are @ mentioned or selected in a picklist field. Export issues, create issue custom view, use notification helper, add and view comments to issues, follow issues, view attachments, view changesets, view linked issues. Add Add issues to the project. Import and clone issues. Edit Owned: Users can edit issues assigned to them and other unassigned issues. Update issues in bulk and update issues by user pick list. Added: Users can edit issues added by them and other unassigned issues. Update issues in bulk and move issues. Both: Users can edit issues added and owned by them. Users can also edit all unassigned issues. Update issues in bulk, update issues by user pick list, and move issues. All: Users can edit all issues in the project. Flag issues as internal or external, move issues, edit issue title and description, filter My Issues by assignee, update issues by user pick list, create custom views with accessibility permissions, link issues. Added: Users can delete issues reported by them in the project. Both: Users can delete issues assigned to them and reported by them in the project. All: Users can delete all issues in the project. None: Users cannot delete issues in the project. Timesheet is accessible only to Project Users. Client Users will not be able to view timesheets. View Owned: Users can view their own time logs. Access task/issue detail page log hours tab. Planned vs Actual report for own tasks (when view task is also enabled). All: Users can view all time logs in the project. View Timesheet Reports, Planned vs Actual report (when view task is also enabled), view time difference column in task Classic View. All: Edit time logs of all users in the project. Filter My Timesheet by assignee, access client and project reports. All: Delete all time logs in the project. None: Cannot delete any time logs in the project. View Users can view documents in the projects. Attach files to tasks. Manage Folders Users can create and upload folders. Dropbox sync, trash folders.